Image: In the Batu Hijau pit, Sumbawa, Indonesia. Porter GeoConsultancy, continued its International Study Tour series of professional development courses during October 2010 by visiting a representative selection of the major porphyry copper-gold deposits of the Asia Pacific, from North Asia, through the Southeast Asian Archipelago, to Australia. The full tour commenced in Ulaanbataar, Mongolia on the evening of Sunday 10 October, 2010 and ended in Sydney, NSW, Australia on the evening of Tuesday 26 October. Participants were able to take any 3 or more days, up to the full tour, as suited their interests or availability, with participants joining and leaving the tour at appropiate locations along the route. 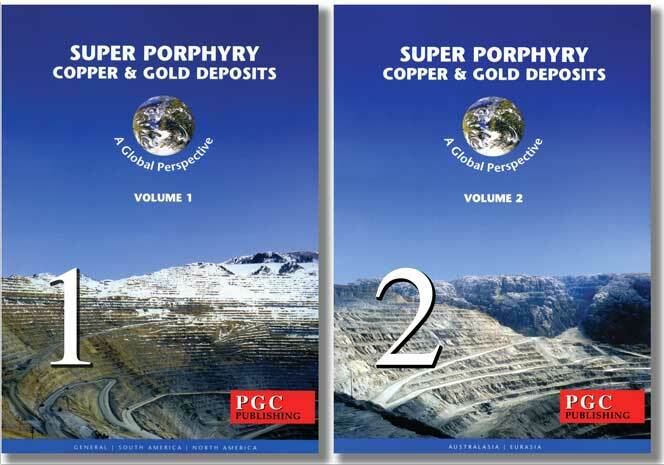 The Siluro-Devonian Oyu Tolgoi high sulphidation porphyry copper-gold-(molybdenum) deposit is located in the Gobi Desert of southern Mongolia, 550 km due south of the capital, Ulaanbaatar and 80 km north of the Chinese border. It contains at least 32 Mt of copper and 990 tonnes of gold in estimated resources and is owned by Ivanhoe Mines. Oyu Tolgoi falls within the Barga terrane, part of the South Mongolian tectonic unit, near the contact with the South Gobi block. It lies within a region dominated by Palaeozoic volcanics, sediments and intrusives with Mesozoic sedimentary cover and represents a zone where a series of magmatic/volcanic island arc and continental blocks, have been accreted, with associated rift basins and continental margin arc settings. The district is dominated by coarse Silurian-Devonian terriginous sediments and intermediate to felsic volcanics (including rhyolitic & dacitic ignimbrites), with lesser basic volcanism. These rocks are intruded by Devonian syenite and granite and Carboniferous diorite, granite, granodiorite and syenite, ranging from dykes to batholiths, and by a Permian per alkaline complex. The four main mineralised centres, Hugo Dummett, Central, South and SW Oyu lie within a 5 km long structural corridor and appear to represent three porphyry centres at South and Central Oyu and near Hugo Dummett. Mineralisation and alteration are associated with small plugs, dykes and hydrothermal breccias and occur as multiple porphyry Cu-Au centres with high sulphidation zones partially telescoped onto underlying porphyry systems. Alteration includes K silicate (quartz-K feldspar-biotite) and overprinting sericite-chlorite at South Oyu, while several advanced argillic and quartz-sericite-illite associations are dominant at Central and North Oyu, over printing and obliterating the earlier K silicate and quartz-sericite stages, particularly in association with hydrothermal breccias. Peripheral, magnetite stable propylitic alteration of calcite, chlorite and epidote is weak, low in pyrite and fringes the advanced argillic alteration at Central and Hugo Dummett. The bulk of the Cu-Au-Mo mineralisation at South and SW Oyu is present as porphyry style heavily stockworked and sheeted veining and is pyrite poor and magnetite rich, dominated by quartz, chalcopyrite, bornite and trace molybdenite in andesite and feldspar-hornblende porphyry. The upper 30 to 60 m is characterised by a mixed sulphide-oxide zone. Only the roots of an original high sulphidation system remain. At Central Oyu copper is present in a supergene chalcocite blanket that formed at the expense of a pyrite rich, hypogene chalcocite-covellite-tennantite (arsenosulvanite, sulvanite, chalcopyrite, bornite) suite that accompanied the advanced argillic alteration. The jarosite-goethite leached capping is 25 to 50 m thick, overlying a chalcocite blanket and a mixed supergene-hypogene zone to depths of 100 to 200 m. The upper 20 to 30 m of the enriched blanket (the main supergene enrichment) has steely chalcocite and minor covellite and digenite and carries from 0.6 to 1.9% Cu. The distribution of gold is erratic and not well defined. High sulphidation systems are partly telescoped into underlying porphyry systems at Central Oyu and Hugo Dummett. At Central Oyu covellite-pyrite is related to an upwardly flared intense quartz-sericite zone, centred on a porphyry style quartz veined dyke swarm. At Hugo Dummett high grade mineralisation is mainly bornite, chalcocite and chalcopyrite, with subordinate pyrite, enargite and tetrahedrite-tennantite to the south, and hydrothermal breccias at a depth of around 100 m below surface. Although some supergene chalcocite is present most high grade is associated with millimetric to centimetric massive sulphide veins. - an indicated resource of 508.9 Mt @ 0.4% Cu, 0.59 g/t Au + an inferred resource of 1.602 Gt @ 0.63% Cu, 0.17 g/t Au. - an indicated resource of 266.9 Mt @ 0.53% Cu, 0.86 g/t Au + an inferred resource of 811.7 Mt @ 0.90% Cu, 0.21 g/t Au. The indicated resource was all at SW Oyu. - measured + indicated resource of 1.387 Gt @ 1.33% Cu, 0.47 g/t Au + an inferred resource of 1.397 Gt @ 0.98% Cu, 0.24 g/t Au. - an indicated resource of 117 Mt @ 1.8% Cu, 0.61 g/t Au + an inferred resource of 95.5 Mt @ 1.15% Cu, 0.31 g/t Au. - an indicated resource of 703.2 Mt @ 1.82% Cu, 0.39 g/t Au + an inferred resource of 722.8 Mt @ 0.97% Cu, 0.30 g/t Au. - an inferred resource of 490.3 Mt @ 1.05% Cu, 0.09 g/t Au. - an indicated resource of 532.4 Mt @ 0.64% Cu, 0.54 g/t Au + an inferred resource of 47.39 Mt @ 0.51% Cu, 0.35 g/t Au. 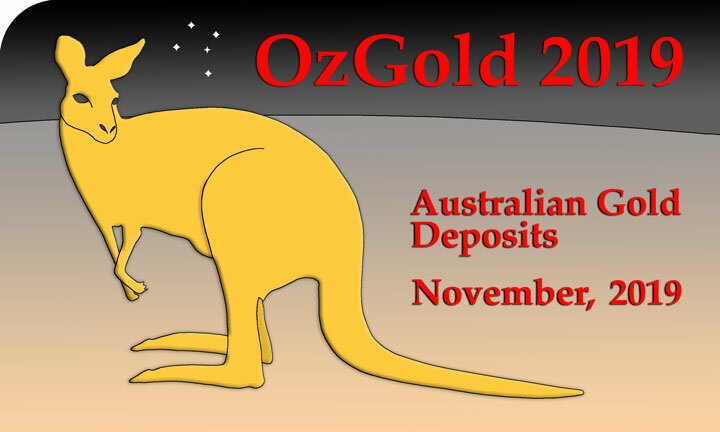 for a total reserve of 930 Mt @ 0.50% Cu, 0.36 g/t Au. Tampakan comprises a highly telescoped copper-gold deposit pair of high sulphidation-epithermal ores overprinting older, erosionally exhumed, deeper-level porphyry-Cu mineralisation, located ~65 km north of General Santos City within southern Mindanao, the Philippines (#Location: 6° 28' 30"N, 125° 3' 0"E). The deposit is hosted by sub-aerial andesites of Miocene to Pliocene age on the western flank of a deeply dissected andesitic stratovolcano belonging to the north-western Sangihe Arc. It lies within the centre of a 100 km wide sinistral strike-slip deformation zone represented by the NW-trending trans-Mindanao Cotabato Fault zone. NNE oriented dilational faults within the Pliocene stress field associated with the Cotabato Fault zone exert a stong control on the epithermal mineralisation at Tampakan. The Tampakan district is centred on a deeply eroded polygenetic volcanic complex which was active episodically from the Late Miocene to late Quaternary. The volcanics and intrusives are dominated by mafic to silicic andesite flows and intrusives of Late Miocene to Middle Pliocene age, with lesser basaltic andesite flows of Late Miocene age and dacitic flow domes and plugs of Pleistocene age. The Tampakan porphyry mineralisation is hosted by Late Miocene and early Pliocene volcanics, whereas the Tampakan high-sulphidation deposit also lies within younger, middle Pliocene volcanic and intrusive rocks. The principal host rocks to the high sulphidation mineralisation are the Tampakan Andesite Sequence of Late Miocene to Mid-Pliocene age. They comprise porphyritic hornblende-pyroxene andesite and silicic andesite flows that dip at 10 to 20° towards the WSW, sub-parallel to the mineralised lithocap in the deposit. Hornblende-diorite porphyry stocks intrude the Tampakan Andesite Sequence in the deposit area, varying from holocrystalline and equigranular to crowded-porphyry-textured intrusives with 70 to 80% phenocrysts. The intrusives form apophysis-like dykes and stocks, and tend to be altered but weakly mineralised. The high sulphidation mineralisation and associated acid alteration form a manto-like zone extending along an erosion surface that exhumed the low grade porphyry Cu system which predated the epithermal phase by ~1 M.y. There is a strong structural and stratigraphic control to the high sulphidation mineralisation, which occurs as a flat lying to gently dipping 200 to 500 m thick body that covers a surface area of some1.6 x 2 km, and lies within a district wide advanced-argillic and argillic lithocap exceeding 90 sq. km. in area. The Pula Bato Fault Zone, which comprises a NNE-trending series of faults that transect the Pliocene volcanic edifice, lies along the long-dimension of the Tampakan orebody. High-sulphidation mineralisation pinches downward along this fault zone, and mushrooms upward into a broad, manto-like, stratabound zone of advanced-argillic alteration that encapsulates the central zones of high-sulphidation ore. The ore is in turn encompassed by a gently dipping, tabular zone of partial to massive silicification accompanied by multiphase brecciation and acid leaching (producing vuggy porosity). The high sulphidation mineralisation is dominated by vein and vug-filling enargite-bornite-digenite-chalcocite-covellite±molybdenite, and is associated with an assemblage of silica-pyrophyllite-dickite-alunite-diaspore±sericite. This alteration grades downwards to sericite-chlorite and relict potassic biotite-chlorite-magnetite-anhydrite alteration and associated weakly mineralised, but pervasively developed quartz stockwork veining that is interpreted to represent the outer shell of a porphyry system. Porphyry Cu-Au mineralisation is widespread below the high sulphidation ores. It is encountered at depths of 400 to 500 m where drilling has passed into low grade chalcopyrite-bornite-pyrite in pervasive quartz stockwork veining, hosted by andesitic flows and the roof zone of high level hornblende-diorite stocks. The principal sulphide and oxide minerals in equilibrium with porphyry-stage anhydrite-biotite alteration are chalcopyrite, bornite, pyrite, magnetite (up to 8%), subordinate specular hematite and molybdenite. This mineralisation is dominated by pink-grey coloured, multi-directional, crudely laminated veins with medial crack-seal textures that contain traces of bornite and/or chalcopyrite and/or pyrite. Anhydrite-bearing veins are less prevalent. Chalcopyrite is the dominant sulphide occurring as disseminated grains, as anhedral inclusions within and along the margins of hydrothermal magnetite grains, and as elongate laths that extend along cleavage planes of hydrothermal biotite grains. Bornite is subordinate to chalcopyrite, and both are always in textural equilibrium, often forming composite sulphide grains. Molybdenite and hematite are minor phases in the potassic alteration zone. Porphyry-stage sulphides also occur as fracture-controlled disseminations within the wallrock to quartz-dominated and lesser anhydrite-bearing veins. The deposit in 2005 (Indophil Resources website) was estimated to contain 12 Mt of copper and 500 tonnes (16 Moz) of gold, but is open both to the west and at depth. 2.4 Gt @ 0.6% Cu, 0.2 g/t Au, 70 ppm Mo, comprising 13.5 Mt of Cu and 490 t of contained Au. The Batu Hijau porphyry copper-gold deposit is located on the south-western corner of the island of Sumbawa in central Indonesia. Following sale of the controlling interests held by Newmont and Sumitomo in late 2016, the deposit is controlled by PT Amman Mineral Nusa Tenggara. (#Location: 8° 57' 57"S, 116° 52' 22"E). The deposit lies within the east-west trending Sunda-Banda magmatic arc at the convergent intersection of the Australian-Indian and the Eurasian plates. The northern half of Sumbawa is occupied by recent volcanoes, while the southern segment, where Batu Hijau is located, comprises oceanic crust overlain by low K calc-alkaline to weakly alkaline andesitic volcanics and volcaniclastics, associated intermediate intrusives and minor shallow marine sediments and limestones. In the mine area the sequence is represented by andesitic volcanic lithic breccias, volcaniclastic sandstones and mudstones and hypabyssal porphyritic andesites, with a younger thick sequence of quartz diorite in the east. Multiple tonalite porphyry intrusions were emplaced along the contact between the andesitic volcaniclastics and the quartz diorite. These tonalites, around which the mineralisation is zoned, are divided into the Old, Intermediate and Young Tonalites. Each has associated quartz veining and Cu-Au mineralisation, with the Old Tonalite having the highest grades and most intense associated alteration. The two following phases have progressively lower grades, vein densities and alteration. v). Zeolite alteration, a low temperature phase of open space filling, The final influence was oxidation to depths of 210 m with weak supergene sooty chalcocite enrichment in a thin 15 to 60 m thick layer. Proven+probable reserves at the end of 2003 were stated as 570 Mt @ 0.55% Cu, 0.37 g/t Au, representing 2.9 Mt of Cu and 215 tonnes of Au. with an average metallurgical recovery of ~73%. For personal security reasons the actual site visit to the Grasberg/Ertsberg operation will be restricted to detailed briefings and comprehensive drill core inspections at the company's secure core facility in Timika. In the Ertsberg Diorite, mineralisation and alteration comprises: i). early feldspar stable potassic alteration with hairline bornite veining, ii). transitional green sericite veins with chalcopyrite and chalcopyrite-pyrite veins and endoskarn development and iii). late quartz-sericite-pyrite±chalcopyrite. The bulk of the ore at Ertsberg has been produced from high grade magnetite-rich, calcium/magnesian skarns which are characterised by magnetite and high temperature assemblages including forsterite, monticellite and minor melilite, as well as diopsidic clinopyroxene, anhydrite and phlogopite. At least 3 garnets have been recognised which decrease with depth. Talc, serpentine, tremolite-actinolite and chlorite are common retrograde minerals. Copper is texturally associated with early retrograde alteration. Chalcopyrite dominated in some bodies (eg. GB and Dom), while bornite is the principal copper sulphide at GBT. The endoskarn of this complex has been dated at 2.71 Ma, while the exoskarns have returned ages of 2.58 Ma (Pollard et al., 2005). Recent drilling at this deposit is continuing to expand the known resources of high grade porphyry Cu-Au mineralisation, overain by a leached cap, supergene blanket and well developed lithocap as well as extensive epithermal mineralisation. The Wafi gold deposits and the related Golpu porphyry copper-gold deposit around 1 km to the north-east, are both parts of a complex hydrothermal system comprising porphyry, as well as high and low sulphidation Cu-Au mineralisation, often with overprinting alteration relationships. These deposits fall within the Morobe Goldfield in Morobe Province, Papua New Guinea, approximately 60 km south-west of the port of Lae and 70 km NNW of the Hidden Valley project. (#Location: 6° 53'S, 146° 27'E). Gold was originally reported from the Wafi River from the 1930s. A 1977 geochemical sampling program conducted in the area by CRAE (no gold assays), part of a program that led to the discovery of the nearby Wamum porphyry copper, returned low level base metal anomalies which were followed up in 1977. During this follow-up program, a pyritic float boulder was identified that assayed 22 g/t Au, 0.57% Pb, 89 g/t Ag. Upstream follow up led to the recognition of altered pyritic volcanics of the Wafi high sulphidation system. The Wafi gold zones were subsequently delineated, but due to the low grade and refractory nature of the gold, the area was joint ventured the property to Elders in 1988. The JV however required Elders to drill 4 conceptual holes based on a consultants structural and fluid flow model to test the source of the high sulphidation fluid. The third of these holes in 1989, intersected 263 m @ 1.86% Cu, 0.27 g/t Au. Elders were subsequently acquired by another party who sold their mineral holdings, which were bought back by CRA. In 2002 the property was taken over by Aurora Gold, then Abelle Ltd who have subsequently been bought by Harmony, the current holder whose principal interest is gold. The Wafi project lies within the Wau Basin, the north-south structural corridor that divides the western and eastern segments of the New guinea Orogen. One of the most intense structures that constitute this corridor, the Wafi Structure, localises the hydrothermal system at Wafi and also produces a dextral offset of the Ramu Fault to the north. The country rock to the mineralised system comprises metasediments of the lower Jurassic to Cretaceous Owen Stanley Metamorphics derived from a sequence of argillite, phyllite, metagreywacke, conglomerate and schist, subsequently metamorphosed to lower greenschist facies and strongly deformed into a series of tight NE trending folds. In the project area, the dominant lithologies are clast supported gabbro-rich conglomerate, sandstone, siltstone and shale, with fine to medium grained sandstones. These have been intruded by the middle Miocene (12.9 ±2Ma) Morobe Granodiorite and the 14 Ma Golpu diorite porphyry, and are unconformably overlain by the Pliocene Babwaf Conglomerate. The mineralised system is reflected at surface by a zone of disseminated pyrite surrounding areas of higher gold content within an advanced argillic, quartz-alunite lithocap. Mineralisation and alteration are associated with a Miocene to Pliocene intrusive complex whose influence is spread over an area of 9 sq. km, centred on the Miocene Golpu diorite to dacite porphyry plug and a late stage overprinting diatreme breccia. The Golpu porphyry copper-gold deposit is associated with a near vertical diorite stock with a diameter of 300 m in its upper sections, contracting to 150 m some 650 m lower. It has a vertical extent in excess of 1200 m and is bounded in part by two NE striking post mineralisation faults. The porphyry system is vertically zoned, with the upper part, below the pyritic advanced argillic quartz-alunite lithocap, being overprinted by a high sulphidation epithermal event that has produced an enargite-covellite-tennantite assemblage. The high sulphidation zone has a well marked base, below which covellite development is associated with a zone of phyllic (silica-sericite-pyrite) alteration, overprinting a lower mass of chalcopyrite-bornite mineralisation at depth accompanied by a core of potassic alteration (biotite-quartz-magnetite±Kfeldspar). Immediately outside of the porphyry contact a 5 to 30 m wide shell of porphyry related stockwork A and D style veining is developed within the meta-sediments (with grades of up to 1% Cu, 2 g/t Au), grading out into propylitic alteration (inner actinolite-epidote and outer epidote-chlorite) and a molybdenum anomalous outer halo. The upper part of the system, above the advanced argillic layer, has a leached cap overlying a thin, rich (eg., 4 m @ 7% Cu) supergene chalcocite-digenite blanket. iv). at the deepest levels, where the potassic alteration is preserved and pyrite-chalcopyrite±gold±bornite±molybdenite ores have grades of 1 to 3% Cu and 1 to 2.5 g/t Au, although much of the pyrite is interpreted to have been introduced during the later high sulphidation event. Native gold occurs as minute inclusions within chalcopyrite and bornite. In mid 2008 the identified mineral resource at Golpu was quoted at 163.1 Mt @ 1.08% Cu, 0.13% Mo, 0.57 g/t Au for 92.2 tonnes (2.96 Moz) of gold (Harmony Gold, website). Recent drilling (2009-10) has indicated extensions of the main Golpu deposit to the northwest and at depth with intersections of 379 m @ 0.88g/t Au and 1.05% Cu from 1062 m (including: 156 m @ 1.09g/t Au and 1.48% Cu from 1149 m), and 528 m @ 0.70g/t Au and 1.41% Cu from 551 m (including: 187 m @ 1.57g/t Au and 3.16% Cu from 892 m). These and other intersections suggest an exploration target in the range of 500 to 800 Mt at grades of between 0.7% and 1.1% Cu and 0.5 to 0.7g/t Au, including the current resource (Harmony Gold press release, April 2010). Probable Reserve - 450 Mt @ 1.2% Cu, 0.86 g/t Au, 1.4 g/t Ag. The Wafi Gold deposit comprises four key zones, (Zone A, Zone B, the Link Zone and the Western Zone) distributed around a core dacitic vent. Two breccias are the centre of interest for the gold mineralisation. The first is limited in extent and is found in the east and south-east of the complex and is fragment rich. The second in the west is a diatreme complex with surface dimensions of around 500 x 1000 m, narrowing drastically with depth to a wine glass shape. It is matrix supported and has milled shale, siltstone and feldspar porphyritic diorite clasts, and a matrix of rock flour, lithic fragments, feldspar and rare quartz crystals. Intense alteration makes the recognition of primary textures difficult, although accretionary lapilli have been recognised. The unmineralised Pliocene Babwaf Conglomerate overlies both the altered and mineralised Owen Stanley Metamorphics, intrusive feldspar porphyritic diorite of the Golpu porphyry and the diatreme. The diatreme breccias which host the Wafi gold orebodies are younger than the main feldspar porphyritic diorite and the potassic and phyllic alteration and associated Golpu porphyry copper, gold and molybdenum mineralisation. The main gold ore occurs with disseminated sulphides within the breccias or as veins in the porphyry and metamorphics. A 2.3 sq km surface zone of pyrite alteration centred on the main diatreme, and extending out into the surrounding Owen Stanley Metamorphics, is overlain by a soil gold anomaly of >0.2 g/t Au and encloses the gold rich bodies that comprise the gold resource. Alteration is concentric from a central advanced argillic core surrounded by an acid-argillic zone of quartz-kaolinite (with up to >75% silica) and then to irregular zones with phyllic and argillic assemblages and finally to propylitic alteration of the surrounding country rock. Gold, with rare exceptions, is submicroscopic and occurs in advanced argillic and phyllic alteration zones. The high sulphidation gold event alteration overprints the Golpu porphyry style alteration and mineralisation, with the diatreme carrying fragments of the earlier porphyry alteration. The high sulphidation event has been interpreted to have remobilised pre-existing porphyry-related copper from the phyllic-argillic altered upper porphyry and deposited this as zoned enargite-tennantite-covellite-chalcopyrite mineralisation, while most gold was introduced in association with pyrite of the high sulphidation event. The low sulphidation Link Zone, which occurs on the diatreme margin, between and below the Zones A and B high sulphidation gold mineralisation, is characterised by veins of mainly of pyrite with lesser quartz (quartz-sulphide-gold style), which are overprinted by more than one generation of pyrite-sphalerite-galena-carbonate veins (carbonate-base metal-gold style). Selective sampling sows the gold in this zone is related to the arsenian pyrite of the quartz-sulphide style veins, while the multi-stage low-arsenic carbonate-base metal veins contribution to the gold grade is insignificant. In mid 2004 the identified mineral resource at Wafi Gold was quoted at 109.6 Mt @ 1.85 g/t Au for 202.5 tonnes (6.51 Moz) of gold (Harmony Gold, website). TOTAL Resource - 133 Mt @ 1.56 g/t Au, 3.4 g/t Ag, containing 207 t of gold. The project is controlled by the Morobe Mining Joint Venture (Harmony 50%, Newcrest 50%). The Cadia Valley Operations (CVO), exploit the Cadia Hill, Cadia Quarry (Cadia Extended), Cadia East, Cadia Far East and Ridgeway porphyry gold-copper deposits which are located ~20 km SSW of Orange in the central tablelands of New South Wales, Australia, ~200 km WNW of Sydney (#Location: Cadia Hill - 33° 27' 28"S, 148° 59' 47"E; Ridgeway - 33° 26' 7"S, 148° 58' 35"E). Cadia Hill, Cadia Quarry (Cadia Extended), Cadia East and Cadia Far East are low grade, bulk mining, porphyry style Au-Cu deposits while Ridgeway, 3 km to the north-west of the Cadia Hill open pit and 500 m below surface, comprises a compact body of quartz veins, sheeted and stockwork quartz and quartz-sulphide veins and disseminated mineralisation with relatively higher grade gold and associated copper mineralisation. Together, these deposits, and the associated altered and mineralised envelope define a NW-trending, 7 km long by up to 2 km wide corridor, in which mineralisation has been intersected by drilling to a depth of more than 1900 m on its eastern extremity. Two historically mined skarn altered deposits, Big Cadia and Little Cadia, fall on the NE peripheries of this corridor. The Ridgeway orebody in the NW is interpreted to be at the deepest level in the porphyry system, progressively shallowing through Cadia Quarry, Cadia Hill and Cadia Far East to the shallowest at Cadia East in the SE (Holliday et al., 2002). Copper and gold were first recognised in the Cadia district in 1851, with sporadic production from several small deposits, the largest being the Iron Duke (or Big Cadia) mine which produced >100 000 t of 5 to 7% Cu from oxidised skarn mineralisation between 1882 and 1917 (see the Cadia Skarns section below for more details). Numerous trenches, limited shallow, mostly exploration shafts of <20 m in depth, and a small open pit were developed over Cadia Hill, targeting both gold and copper along discrete structures, but with no significant production. During the world wars, >1.5 Mt @ ~50% Fe were mined from Iron Duke (Wood and Holliday, 1995). During the 1950s and 1960s, several major companies explored the district, although no significant work was undertaken over Cadia Hill until the 1970s. Pacific Copper was granted an exploration title over the Cadia Valley area in 1968 and completed extensive drilling programs, mostly over Big and Little Cadia to delineate resources of 30 Mt @ 0.5% Cu, 0.4 g/t Au and 8 Mt @ 0.4% Cu, 0.3 g/t Au respectively. Limited reconnaissance drilling in the vicinity of the historic small open pit on the southeastern margin of Cadia Hill encountered low grade mineralisation, with the best intersection being 97 m @ 0.95 g/t Au, including 34 m @ 1.5 g/t Au. No further work was carried out at Cadia Hill until 1985, when Homestake Mining, in joint venture with Pacific Copper, conducted a regional geochemical sampling program that outlined a cohesive rock and soil anomaly with vales of up to 1.1 ppm Au. Follow-up included RAB and RC percussion holes, whilst a single shallow diamond drill hole 100 m west of the old open cut, intersected 96 m @ 0.6 g/t Au. These values were regarded as disappointing and Homestake withdrew in 1986 (Wood and Holliday, 1995). Over a four year period from late 1986, BHP Gold Mines, which was seeking additional feedstock for the mill at its small Browns Creek gold mine 17 km to the SE, negotiated with Pacific Copper, by then a Bond Corporation subsidiary, to finally purchase the rights to the title over the Cadia skarn deposits in early 1991. In the interim, Newmont Australia and BHP Gold Mines had merged their interests in 1990 to form Newcrest Mining Limited who became the beneficiary of the acquired title. Although the initial concentration was on the resource at Big Cadia, Newcrest geologists embarked upon a program of relogging past drill core, geological mapping and soil sampling. This led to an understanding that the skarn alteration, volcanic-, and newly mapped monzonite porphyry-hosted mineralisation in old workings were part of a larger, >4 km long hydrothermal system of possible porphyry affiliation. It also delineated a cohesive, 800 x 200 m, +0.4 ppm Au and enveloping +250 ppm Cu C-horizon soil anomaly within a zone of potassic altered host rocks in the Cadia Hill area. Initial drilling in late 1992 encountered similar intersections to those of Pacific Copper and Homestake, but progressively improved, until the sixth and final hole of the planned program, intersected 217 m from 56 m depth @ 1.36 g/t Au, 0.15% Cu. By September 1994, an inferred resource of 230 Mt @ 0.85 g/t Au, 0.16% Cu had been estimated (Wood, 2012). Conceptual reasoning, and 'wildcat' deep step-out drilling below thick Silurian cover along trend to the SE ensued, encouraged by a local exposure of barren but intensely pyritic phyllic alteration. This progressively led to the discovery of Cadia East and the outer fringe of the deeper, higher grade extension, Cadia Far East, in August 1996 with 112 m at 2.1 g/t Au and 0.56% Cu. A mineral resource of 320 Mt at 0.45 g/t Au and 0.36% Cu was eventually estimated for the shallower Cadia East body of mineralisation, but further drilling and realisation of the extent and grade of the richer Cadia Far East was delayed by the Ridgeway discovery (Wood, 2012). During the same period, further step-out drilling to the NW had encountered the Cadia Quarry mineralisation. Then, augmented by the detection in an induced polarisation survey of what was later realised to be the upper peripheral disseminated pyrite halo to mineralisation, the blind, high grade Ridgeway deposit was intersected. This step out drilling had been painstaking and strongly influenced by alteration and mineralisation pattern vectors. The main Ridgeway discovery hole in December 1996 intersected two intervals of 145 m @ 4.3 g/t Au and 1.2% Cu, from 598 m downhole, and 84 m @ 7.4 g/t Au and 1.3% Cu from 821 m. By 1998, a resource of 44 Mt @ 2.8 g/t Au, 0.82% Cu had been estimated at Ridgeway. Drilling at Cadia Far East was at a reduced rate during the main Ridgeway program, and was based on investigating various vectoring factors, eventually understanding that better grades corresponded to an increase in Au:Cu ratio. By 2001, an initial inferred resource at Cadia Far East of 200 Mt @ 1.1 g/t Au, 0.41% Cu had been estimated (Wood, 2012). Open pit mining commenced at Cadia Hill in 1998, subsequently extending into Cadia Quarry. Between 1998 and 2011, these pits produced 678.6 Mt @ 0.74 g/t Au, 0.19% Cu, with metallurgical recoveries of 76.4% Au, 84.5% Cu. Sub-level caving underground operations were initiated at Ridgeway in 2002, followed in 2009 by the Ridgeway Deeps block cave at a lower RL. Production between 2002 and 2011 totalled 51.2 Mt @ 2.07 g/t Au, 0.73% Cu, with metallurgical recoveries of 84.5% Au, 90.2% Cu (Thomas et al., 2011). The Cadia East underground panel cave mine began production in January 2013, based on a probable ore reserve of 960 Mt @ 0.61 g/t Au, 0.33% Cu in the combined Cadia East and Cadia Far East. 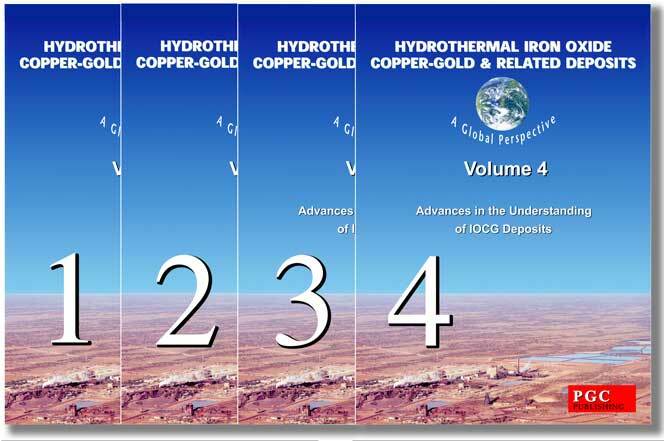 Current remaining reserves and resources are detailed in Reserves and Resources section below. The Cadia deposits are hosted within both Ordovician volcanic and volcaniclastic country rocks and the related intrusives of the Molong Volcanic Belt, one of four segments of the dismembered intra-oceanic Macquarie Volcanic Arc which falls within the Eastern Subprovince of the Lachlan Orogen. The Macquarie Arc was developed in response to west-dipping intra-oceanic subduction along part of the boundary between eastern Gondwana and the proto-Pacific Plate and was situated on the Gondwana Plate, some 1000 km east of Precambrian continental crust. The intervening area was occupied by a back arc basin that developed on oceanic crust as the proto-Pacific Plate retreated eastwards after the Middle Cambrian Delamerian Orogeny. Subsequent extension, strike-slip translation and thin-skinned tectonics have structurally dissected the single arc into four north to NNE trending structural volcanic belts of Ordovician calc-alkaline rocks that are separated largely by younger rift basins and in part by coeval craton-derived turbidites. Two of these volcanic belts host relatively undeformed, shoshonitic, Ordovician volcano-intrusive complexes that host porphyry and high sulphidation epithermal gold mineralisation. Geophysical (seismic-reflection: Glen et al., 2002) and geochemical (εNd: Wyborn and Sun, 1993; Pb isotopes: Carr et al., 1995) data suggest that the Macquarie Volcanic Arc developed over a basement of oceanic crust, with little evidence for input from continental crust. Evidence from the two larger volcanic segments (the Junee-Narromine and Molong volcanic belts) Glen et al. (2003) proposed the Macquarie arc developed episodically over a period of about 50 m.y. The three pulses of volcanic activity observed in these belts (Early Ordovician, ~490 to 475 Ma; Middle Ordovician, 464 to 455 Ma; and Late Ordovician to Early Silurian, 450 to 439 Ma) were separated by two major volcanic hiatuses. Glen et al. (2003) also recognised four episodes of porphyritic intrusives in the Macquarie arc: i). ~484 Ma high K calc-alkalic to shoshonitic monzonites; ii). 465 to 455 Ma high K calc-alkalic monzogabbros to monzonites; iii). 455 to 450 Ma medium K calc-alkalic dacites; and iv). ~439 Ma shoshonitic monzodiorites to quartz monzonite porphyries. These intrusive episodes have associated ore deposits of differing styles, including alkalic to shoshonitic porphyry Cu-Au deposits at Cadia (456 to 454 and 438 Ma), Kaiser and Northparkes (episodic activity from 484 to 439 Ma); alkalic epithermal Au-Zn at Cowal (~439 Ma K diorite to quartz monzonites); calc-alkaline porphyry Cu-Au mineralisation at Copper Hill (~450 Ma), Cargo (~450 Ma), E39, The Dam and Marsden (~439 Ma); and Au skarn at Junction reefs; and high sulphidation Au at Peak Hill and Gidginbung. 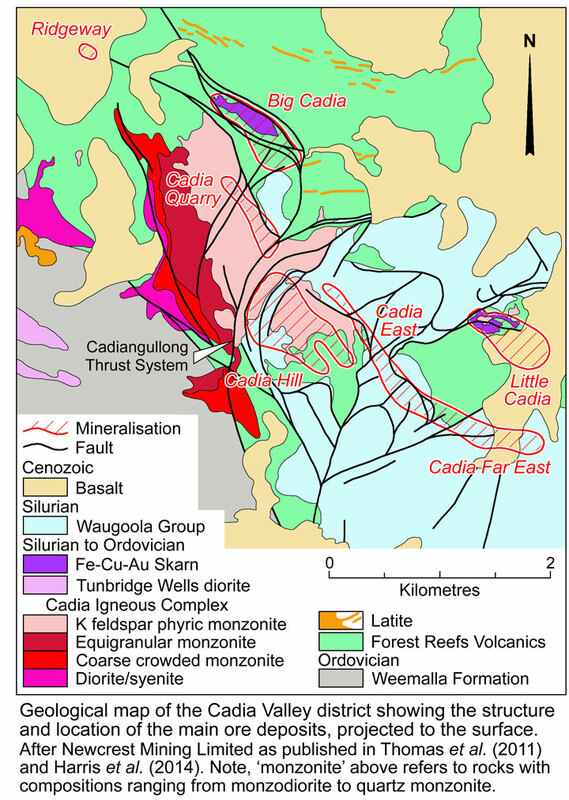 The currently exploited porphyry gold-copper deposits are localised in two tight clusters in the Cadia and Goonumbla districts, which are approximately 100 km apart, and fall within a major, long-lived, NW- to WNW-trending, semi-continental scale, structural corridor known as the Lachlan Transverse Zone. The CVO ore deposits formed immediately prior to and during the Late Ordovician to Early Silurian Benambran Orogeny that accreted the Macquarie Arc to Gondwana. The up to 2.5 km thick Ordovician sequence preserved in the Cadia district commences with the Weemalla Formation which is at least 1000 m thick and comprises a fine grained unit of thinly laminated, carbonaceous to volcanic siltstones, with minor arenaceous volcanic beds (Holliday et al., 2002). The conformably and gradationally overlying Forest Reefs Volcanics are composed of five lithofacies: (1) intermediate volcanic lithic conglomerates, breccias and sandstones, comprising the bulk of the formation; (2) bedded calcareous volcanic sandstone; (3) laminated siliceous volcanic siltstone; (4) massive basaltic to basaltic-andesite flows; and (5) porphyritic basaltic to andesitic hypabyssal to sub-volcanic intrusions, with either pyroxene or plagioclase phenocrysts (Wilson et al., 2003). Porphyry-style mineralisation is centred on a compositionally zoned, multiphase pluton of dioritic to monzondioritic, monozonitic and quartz monzonitic intrusions, with syenitic phases, that constitutes the Cadia Igneous Complex (CIC). Narrow pipe-like stocks and dykes cutting both the volcanosedimentary rocks and the central intrusive complex are associated with gold and copper mineralisation. The CIC youngs eastwards across the Cadia Valley. U-Pb dating of igneous minerals (Wilson et al., 2007b) indicate the monzonitic intrusives at Ridgeway and a quartz monzonite porphyry stock that lies immediately SW of Cadia Quarry are early Late Ordovician (456 to 454 Ma), whilst the quartz monzonite porphyry stock that hosts the Cadia Quarry and Cadia Hill orebodies, and a similar composition inter-mineral porphyry dyke at Cadia East, are all of Early Silurian (~438 Ma) age. The unconformably overlying Silurian Waugoola Group is at least 200 m thick, and is predominantly composed of dark grey to green, fine-grained siltstones, with subunits of fine grained, light grey quartz sandstone and a pink crinoidal limestone band. Basalts of the middle Miocene Canobolas Volcanic Complex that are 50 to 80 m thick cover the Paleozoic rocks in the north and east of the district, whilst Tertiary gravels predominate to the south (Holliday et al., 2002). The CVO deposit cluster is centred on a small NW-trending volcano-sedimentary sub-basin, the controlling faults of which predate porphyry mineralisation and are oriented parallel to a major arc-transverse lineament. Porphyry Au-Cu mineralisation was influenced by reactivation of the sub-basin during an extensional pulse, with dilation of the controlling faults facilitating emplacement of alkalic porphyry dykes and associated sheeted quartz-sulphide veins. During the Middle Silurian, a successor north-trending fault-bound marine basin buried Cadia East, preserving the higher levels of the ore system. These north-trending faults were reactivated as the Cadiangullong thrust system during east-vergent Devonian compression at the end of the Benambran Orogeny, progressively imbricating and juxtaposing blocks containing Cadia Hill, Cadia Quarry and Ridgeway over Cadia East, thereby superposing different levels of the porphyry Au-Cu system (Fox et al., 2015). The Cadia-Ridgeway cluster of deposits are principally associated with a 3 x 1.5 km late Ordovician composite quartz-monzonite to dioritic porphyry stock and its probable co-magmatic volcanic wall rocks and intercalated volcaniclastics that together form part of an Ordovician volcano-intrusive Cadia Intrusive Complex (CIC). The intrusive complex is represented as the stock at Cadia Hill and Cadia Quarry, a narrow restricted pipe-like intrusion at Ridgeway and as a series of dykes at Cadia East. Overall the stock has an alkaline composition, with mineralisation and alteration being associated with porphyritic quartz-monzonite phases that are altered over an area of 5.5 x 3 km and to a depth of up to 1.6 km, defining a NW trending corridor that encloses the known deposits. (v) Probable late stage distal veins. Cadia Hill was the first of the deposits to be mined on a large scale as part of the present Newcrest Mining Ltd Cadia Valley Operations. The ore grade mineralisation is predominantly hosted by a quartz monzonite porphyry phase of the CIC, although a small portion cuts a roof pendant of Forest Reefs Volcanics at the eastern end of the deposit (Holliday et al., 2002). The deposit was exploited via a large tonnage low grade open pit mine. The Cadia Hill deposit is bounded on three sides by postmineral faulting. To the west, a west-dipping reverse imbricate system, the Cadiangullong Fault, which encloses slivers of the Silurian Waugoola Group, truncates the ore and juxtaposes a block of quartz monzonite porphyry hosting the Cadia Quarry deposit over the Cadia Hill mineralisation. On its eastern margin, the quartz monzonite porphyry hosting the Cadia Hill deposit is thrust over Forest Reefs Volcanics carrying the Cadia East mineralisation, by the west dipping reverse Gibb Fault which has a displacement of at least 300 m. The northern side of the deposit is bounded by a NE-striking, steeply NW-dipping fault. Fault dislocation is also evident within the deposit where disparate ore zones with varying metal ratios, grades and vein densities are juxtaposed across fault planes (Holliday et al., 2002). Mineralisation at Cadia Hill occurs as chalcopyrite, native gold, lesser pyrite and bornite, which are disseminated within and immediately adjacent to the quartz-carbonate veins of a low density sheeted vein array hosted almost entirely within quartz monzonite porphyry of the CIC, with just a small roof pendant of Forest Reefs Volcanics on the eastern end of the deposit. Post-Silurian faulting has bounded and internally dismembered the mineralisation that now occurs as an imbricate thrust slice truncated by faulting in all directions, forming a 300 m wide tabular envelope dipping at 60° to the SW. This envelope persists over a length of ~900 m and to a depth of at least 800 m beneath the surface, although grades diminish below 600 m (Holliday et al., 2002). Within the envelope, veins range from 1 to 100 mm in width, with densities from 2 to 10 per metre, but locally in the core of the deposit may exceed 15 per metre. Gold grades can be broadly correlated with the intensity of chalcopyrite bearing veins, irrespective of the host lithology. In general, the higher copper grades are found in the core of the deposit where chalcopyrite dominates over pyrite. This zone is flanked by decreasing chalcopyrite:pyrite ratios, both outwards from the core and down dip/plunge. The chalcopyrite:pyrite ratio, however increases up dip and to the NW where zones carrying bornite become increasingly abundant. A higher grade copper zone is localised at the northwestern end of the deposit, with grades of up to 0.5% Cu being encountered in an interval where bornite and chalcopyrite occur as minor infill in a crackle brecciated quartz monzonite porphyry (Holliday et al., 2002). A pervasive, rarely texture destructive, propylitic alteration comprising a chlorite, albite, epidote and calcite assemblage is the most widespread overprint. The quartz monzonite porphyry has a pervasive pink colouration due to disseminated, sub-microscopic, hematite in both feldspar phenocrysts and in the groundmass, a feature common to the CIC in the Cadia Valley deposits. Potassic (orthoclase) alteration is manifested as narrow selvages to chalcopyrite and bornite bearing quartz veins and as ragged patches partially replacing some plagioclase phenocrysts and overprinting the earlier albite and chlorite phase and its associated magnetite veining. In addition, late- to postmineral, milled, jigsaw-fit breccias have chlorite altered rock flour cement. Sericite-pyrite alteration, with localised sphalerite and galena is also found, in association with NWstriking late mineral faults, while weakly developed postmineral crackle breccias have a laumontite-epidote-calciteorthoclase±fluorite cement and are found throughout the deposit (Holliday et al., 2002). Cadia Quarry (now known as Cadia Extended) lies in the hangingwall block of the west-dipping Cadiangullong reverse fault, and is located immediately to the NW of the Cadia Hill pit. It is almost entirely hosted by quartz monzonite porphyry (Holliday et al., 2002). The deposit was exploited via a high tonnage, low grade open pit, which is an extension of the Cadia Hill mine. Mineralisation and alteration is largely similar to that described above for Cadia Hill. However, in addition to the sheeted quartz-carbonate vein mineralisation, there are locally high copper-molybdenum zones containing coarse grained chalcopyrite and molybdenite, which are intergrown with quartz-orthoclase-biotite-calcite-pyrite as cement in open space pegmatitic breccias within the host quartz monzonite porphyry. The breccias follow the NW to NNW-structural grain of the Cadia district and take the form of elongate pipes/dykes up to 150 m long and 10 m wide, which persist to depths of as much as 500 m. The clasts within the breccias are strongly sericite altered quartz monzonite porphyry, while the pegmatitic textures and the mineralogy are suggestive of high temperature formation (Holliday et al., 2002). The Cadia Quarry mineralisation has a grade boundary to the west, where its tenor decreases to that of a geochemical anomaly which persists under cover for some 2 km to the west, to beyond the Ridgeway deposit. To the north, the deposit is terminated at the steep intrusive contact between the host quartz monzonite porphyry and the Forest Reefs Volcanics. This contact contains some localised, weakly gold-copper mineralised epidote-garnet-magnetite skarn. To the south, copper and gold grades gradually decrease as the quartz monzonite porphyry grades into a more mafic phase of the CIC (Holliday et al., 2002). Cadia East and Cadia Far East, are exploited by the Cadia East mine. Together they extend SE to ESE over an interval of ~2500 m in strike length, 200 to 300 m in width and >1900 m in vertical extent, plunging to the SE. It is located to the east of, and structurally below the Cadia Hill deposit. The composite deposit is hosted by a more than 2000 m thick, shallow to flat dipping sequence of the Forest Reefs Volcanics, comprising predominantly volcaniclastic breccias and conglomerates (known as lithofacies 1) and lesser pyroxene- and feldspar-phyric lavas (known as lithofacies 4). Minor monzodiorite to quartz monzonite stocks and dykes belonging to the CIC intrude these Forest Reefs Volcanics units, and in part host mineralisation at depth in Cadia Far East. The Ordovician rocks and the mineralisation are unconformably overlain by up to 200 m of the Silurian Waugoola Group (Holliday et al., 2002). • An upper zone of disseminated, copper dominant mineralisation within a 200 to 300 m thick, shallow dipping, unit of volcaniclastic breccia (lithofacies 1) where it is sandwiched between two coherent porphyritic volcanic bands (of lithofacies 4) - an upper feldspar porphyry and a lower pyroxene-phyric unit. This zone comprises the shallow western sections of the Cadia East open pit deposit. Within this zone, disseminated chalcopyrite-bornite forms a core zone, capped by chalcopyrite-pyrite mineralisation (Holliday et al., 2002). • A deeper, central gold rich zone with sheeted veins, which is localised around a core of steeply dipping sheeted quartz-calcite-bornite-chalcopyritemolybdenite±covellite±magnetite veins. The highest grade gold is associated with the widest bornite-bearing veins, where native gold is commonly intergrown with bornite (Holliday et al., 2002). Elevated molybdenite levels are mostly associated with the upper disseminated copper zone, although molybdenum continues below this zone at depth, where it also occurs along both the hangingwall and footwall of the gold rich sheeted vein interval (Holliday et al., 2002). i). Intense silica-albite±orthoclase±tourmaline, with a late sericite-carbonate overprint. Pyrite and minor fluorite are observed, although no magnetite remains. This zone forms a layer at shallower depths, that is semi-conformable with the Forest Reefs Volcanics stratigraphy, replacing more permeable volcaniclastic breccias. It is mainly the product of late sericite-carbonate and tourmaline overprinting of zone 2 type alteration and the destruction of magnetite. The upper disseminated copper rich mineralisation falls within this alteration zone. ii). Moderate to intense, grey, silica-albite-orthoclase flooding with minor hematite staining. Hydrothermal magnetite is common and chlorite occurs as a late overprint. This style of alteration grades into an outer propylitic zone of chlorite-epidote±actinolite±calcite. iii). Pervasive potassic alteration comprising albite-orthoclase-quartz-biotite-actinolite-epidote-magnetite with sulphides. Late chlorite is an overprint on biotite. Albite replaces magmatic plagioclase, while orthoclase occurs as an alteration selvage to mineralised veins. This zone occurs at greater depths, and overprints and passes out and upward into zone ii. The mineralised sheeted veins, particularly the gold rich zone, are accompanied by the most intense developments of this potassic zone, although the sheeted veins also persist into zone ii alteration. Cadia East and Cadia Far East have been dislocated by at least three significant fault zones. Reverse movement on the major NE-trending, west dipping, Gibb Fault truncates the mineralised system and juxtaposes the Cadia Hill deposit over the Cadia East mineralisation on its western margin. A second, un-named, east trending reverse fault with a steep north dip occurs around 1 km to the east of the Gibb Fault and has displaced mineralisation by at least 100 m. A third significant fault is the east trending Pyrite Fault Zone which lies parallel to the main mineralisation direction at Cadia Far East, and has both syn- and post-mineralisation movement as indicated by milled clasts of pyrite, quartz and carbonate within a locally sericitic fault gouge (Holliday et al., 2002). Cadia Skarns - Two gold-copper-hematite-magnetite skarns, Big Cadia (also previously known as Iron Duke) and Little Cadia, have long been known in the Cadia Valley. Prior to the discovery of Cadia Hill, Iron Duke (Big Cadia) had been by far the largest producer in the district, having yielded more than 100 000 t of secondary copper ore @ 5 to 7% Cu from underground operations from 1882 to 1898, and 1905 and 1917, and 1.5 Mt of iron ore @ approximately 50% Fe from 1918 to 1929 and 1941-1943 (Welsh, 1975). Based on drilling during the 1960�s, there is an estimated potential of 30 Mt @ 0.4 g/t Au, 0.5% Cu for 12 tonnes of contained gold at Big Cadia and 8 Mt @ 0.3 g/t Au, 0.4% Cu for 2.4 tonnes of contained gold at Little Cadia (Holliday et al., 2002). Big Cadia lies about 100 m north of the drill intersected contact of CIC monzonite and is some 200 m north of Cadia Quarry, while Little Cadia is some 800 m north of the Cadia Far East deposit (Holliday et al., 2002) and 2 km SE of Big Cadia (Holliday et al., 2002). Both skarn zones are around 1000 m long, 250 m wide and average 40 m thick, although in the centre of Big Cadia it reaches 70 m and is 50 to 85 m thick at Little Cadia. Weathering has resulted in the oxidation and slight secondary enrichment of each of the skarns (Welsh, 1975; Holliday et al., 2002). Primary gold-copper mineralisation at both occurs in association with the hematite-magnetite skarn that formed in the impure bedded calcareous volcanic sandstones of lithofacies 2, at the top of the Forest Reefs Volcanics. Elevated copper and gold grades are found in both the skarn and in a surrounding alteration envelope of epidote-quartz-actinolite-chlorite-sericite-calcite-rutile imposed on volcanic conglomerates of the underlying lithofacies 1 of the Forest Reefs Volcanics. Where best developed, the skarn comprises intergrowths of fine to coarse bladed hematite (partially replaced by magnetite) with interstitial calcite±chlorite±pyrite/chalcopyrite. Green (1999) presented mineralogic and isotopic evidence that suggested fluids infiltrated northwards from the CIC, along the volcaniclastic unit, to form Big Cadia. At Little Cadia many drill holes have intersected monzonite possibly belonging to the CIC below the skarn (Holliday et al., 2002). Ridgeway is a high grade gold-copper porphyry deposit. It is the deepest formed and highest grade of the four main deposits within the Cadia-Ridgeway mineralised corridor. The deposit is an upright, bulbous body of stockwork quartz veining and alteration zoned around a 50 to 100 m diameter, vertically attenuated, alkalic intrusive plug of porphyritic Cadia Hill Monzonite, which is of monzodioritic to quartz monzonitic composition and is part of the CIC, but some 500 m NW of exposures of the main CIC body, and concealed at a depth of 450 m below the present surface (Wilson et al., 2003). Mineralisation and alteration are hosted both by the intrusive and by the surrounding volcanic rocks of the Forest Reefs Volcanics, at and just above, the contact with the underlying Weemalla Formation. The dominant volcanic host occurs as massive bands that are >50 m thick of intercalated volcanic lithic conglomerates to breccias, and bedded volcanic sandstone. Intercalated with these bands are up to 100 m thick packages of plagioclase, crystal-rich volcanic sandstones that may locally, but not commonly, show graded bedding on scales of metres to tens of metres. Other minor lithofacies include clinopyroxene-phyric basaltic to basaltic andesite flows and a series of steeply north to NE dipping clinopyroxene-phyric basaltic to plagioclasephyric andesitic dykes (Wilson et al., 2003). The Ridgeway complex of intrusions are physically separated from, but are petrographically and compositionally identical to, and is believed to be connected at depth to, the main Cadia Igneous Complex (CIC). The earliest phase of the Ridgeway intrusions is an equigranular monzodiorite occurring as a NW elongated, steep north dipping, 200 x 50 x 500 m body with an elliptical cross section, located on the southwestern margin of the Ridgeway orebody. In detail it occurs as two lobes, cut by the mineralisation, and is interpreted to be pre-mineral (Wilson et al., 2003). The main mineralisation at Ridgeway is spatially related to three groups of monzonite intrusions (early-, inter- and late-mineral), all of which are post-monzodiorite. They form an irregularly shaped composite plug with dimensions of 70 x 100 x 600 m, immediately to the NE of the monzodiorite. The individual bodies of the composite mass having dimensions from metres to tens of metres horizontally and up to 200 m vertically. Multiple intrusion and mineralising phases are indicated by truncation of contacts and veins (Wilson et al., 2003). The highest grade gold accompanies the most intense alteration and stockwork development immediately adjacent to the monzonite porphyry, with the best being localised directly above the plug compared to grades on its lateral margins. Grades decrease laterally outwards and inwards from the intrusive contact. The top of the Ridgeway deposit (defined by the 0.2 g/t Au cut-off) is some 500 m below the current surface, and takes the form of a subvertical, pipe like, quartz-sulphide vein stockwork body, with a WNW elongated axis and an elliptical 150 x 250 m horizontal shape which persists over a vertical interval of more than 600 m. Distinct styles of veining and alteration are related to each of the three monzonitic intrusive phases of the igneous complex. The metal grades and intensity of alteration decrease from the early- to the late-mineral phases of the intrusive (Wilson et al., 2003). Early-mineral intrusion is accompanied by intense actinolite-magnetite-biotite (calc-potassic) alteration and up to four stages of high grade quartz-magnetite-sulphide veins, all of which contain abundant magnetite, actinolite and bornite with variable amounts of chlorite, biotite, chalcopyrite, pyrite, quartz and orthoclase. Bornite, which is the most abundant sulphide, correlates closely with gold. Magnetite dominates in the earliest vein stage, while in the last, chalcopyrite becomes more important. Some of these veins persist for up to 350 m outwards from the Ridgeway Igneous Complex (Wilson et al., 2003). Moderate- to weak-intensity potassic alteration as orthoclase-biotite±magnetite accompanies both the inter- and late-mineral intrusions and is associated with chalcopyrite- and pyrite-rich quartz-orthoclase veining. The veining and alteration accompanying the inter-mineral phase intrusives is referred to as transitional-stage veining and transitional-stage alteration respectively. Transitionalstage alteration assemblages are characterised by orthoclase, biotite (mostly retrograde altered to chlorite) and magnetite with minor quartz, titanite and apatite. The transitional-stage veining occurs as up to 4 styles which contain variable amounts of magnetite, chalcopyrite and pyrite with quartz and orthoclase, while bornite is rare to absent. The late-mineral monzonite intrusives is accompanied by weak late-stage alteration, occurring as weak pervasive potassic (orthoclase) development around late-stage veins, and chlorite alteration of mafic components of the monzonite. The late-stage veins are characterised by pyrite±chalcopyrite with fluorite, but no bornite or actinolite, and gangue progressing from quartz to sericite to chlorite-calcite from early to late phases (Wilson et al., 2003). Three discrete and partially zoned hydrothermal alteration suites are found on the periphery of the Ridgeway deposit, namely: i). an inner propylitic; ii). an outer propylitic; and iii). a sodic assemblage. These are peripheral to, and locally overprint, the potassic phase. Peripheral veins are characterised by epidote, prehnite, quartz and calcite in varying proportions with varying sulphides, depending on the position within the deposit. Some of the outer veins, up to 200 m beyond the inner propylitic zone, carry chlorite/ calcite-sphalerite-chalcopyrite ±galena. Phyllic alteration is only found on the margins of late stage faults (Wilson et al., 2003). Ridgeway in 2002 - 54 Mt @ 2.5 g/t Au, 0.77% Cu for 132.6 t of contained Au. Cadia East was un-mined in 2010. Cadia East underground - 1073 Mt @ 0.60 g/t Au, 0.32% Cu. Cadia East underground - 2347 Mt @ 0.44 g/t Au, 0.28% Cu. The total declared measured+indicated+inferred resource in the Cadia district was estimated in 2010 to contain 1360 tonnes (43.7 Moz) of gold and 7.99 Mt of copper. 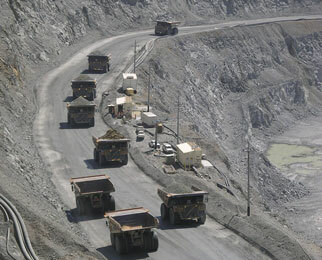 The Cadia-Ridgeway mines are operated by Newcrest Mining Ltd. The summaries above were prepared by T M (Mike) Porter from a wide range of sources, both published and un-published. Most of these sources are listed on the "Tour Literature Collection" available from the AsiaPacific 2010 Tour options page.